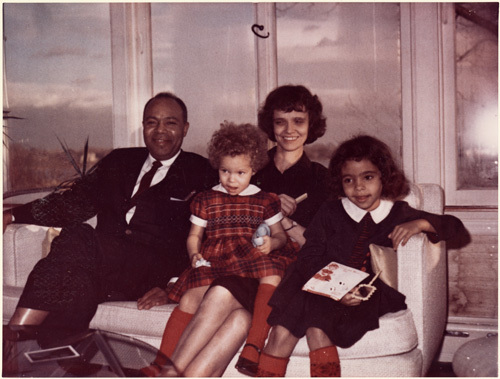 This is a 1965 photo of Lula Farmer (center) with her husband James Farmer, founding member of CORE and its national director at the time. Their daughter, Abbey, is seated to the left. The second photo includes their other daughter, Tami (black dress). Like James, when Lula first came to New York she lived in the Harlem Ashram (he had already moved out). Both were members of New York CORE before 1961. She was also chapter chairman in 1953. Along with James Robinson and James Peck, she is widely credited with saving CORE from extinction during the 1950's. A Phi Beta Kappa key in Economics, she handled accounting for CORE and became for a time national treasurer. 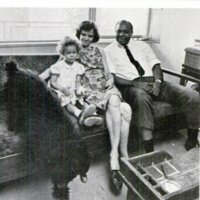 “photo of Lula Farmer with husband James Farmer, CORE founder and national director,” corenyc.org, accessed April 21, 2019, http://www.corenyc.org/omeka/items/show/148.